Most of us have either heard about the Neighborhood Watch program or perhaps participated in the past, whether in Speedway or another community you have lived. Others may have grown up in a small community that didn’t have an official, organized Neighborhood Watch program but all the neighbors and their children knew each other and everyone watched out for each other because that was what neighbors did. Times have changed and so has the dynamic of families and neighborhoods. Whether single parents or two parents working, as well as kids busy with after school activities, sports, etc. we spend less time at home; and when we are home, much of that time is spent indoors on computers or mobile devices. We are connected in different ways now – socializing is not always done with two neighbors chatting over the fence; often it’s done via social media, email, or text. It’s easier than ever to connect with people around the world but less so with our neighbor next door or across the street. Though Speedway has been very fortunate, we are certainly not immune to the crime that has been happening around us. That disconnection from our neighbors, combined with less time at home, creates a perfect opportunity for criminals. Regardless of our perception of safety, crime does exist. In the Indianapolis area, we hear every day about shootings, home invasions, assaults, car jackings, etc…it’s easy to either become desensitized and apathetic or else become extremely worried and stressed about crime. It’s even more difficult because it’s not just between criminals, such as gang violence or a drug deal gone bad, and in areas we don’t frequent. Crimes, many of them violent, are happening in areas we do frequent; our retail shopping and recreation areas, schools and churches, and worst of all, in the very place we’re supposed to feel most comfortable: our homes. Speedway is a unique and excellent community to live, work, and play – we have lots of great history and many wonderful events in town to enjoy. That’s exactly what we all want to do – enjoy our lives, worrying in fear about crime and allowing it to take away our enjoyment of life. But we cannot ignore the crime problem (or the potential, which exists whether we choose to acknowledge it or not). We cannot become apathetic or desensitized. The best solution clearly lies in between the extremes. Our fear can be utilized in a positive way, by becoming active in our community, being prepared by protecting our homes; partnering with SPD by committing to being good, caring neighbors by watching out for unusual or suspicious activities and promptly reporting them to SPD. Many people tell us they don’t need to be involved in Neighborhood Watch because we have a great police department that takes care of crime and protects us. It’s certainly true that Speedway has a great police department! But to prevent crime, they need our help to be their extra eyes and ears, because they simply cannot be everywhere, at all times. But we are; we live here and know our neighborhoods and what’s out of the ordinary. Another thing we hear is that people don’t know what to look for or just aren’t sure if something is out of the ordinary or else they feel like they’re bothering the police over something minor. Many minor things can lead to major crimes and very often, reporting something that’s “just not right” results in prevention of a crime. SPD has repeatedly indicated at Neighborhood Watch meetings, that they encourage residents to call them when we see anything out of the ordinary or suspicious. Far better to have something checked out that turns out to be nothing than assume it’s nothing and it leads to a crime that could have been prevented! 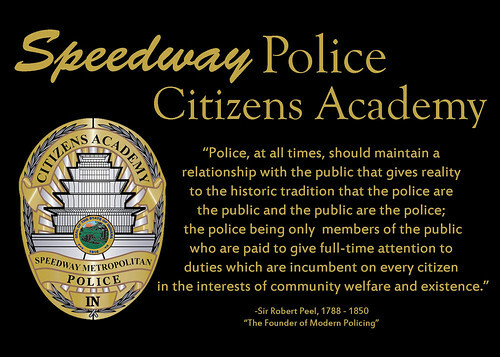 The Neighborhood Watch program in Speedway is one of two ways the Speedway Police Department is reaching out to residents regarding its community policing efforts (the other is the Speedway Police Citizens Academy, which you can read more about in the “About Us” page of this blog). The philosophy of community policing is the formation of a community and police partnership, working together to solve problems in our community. Some of the goals of Neighborhood Watch program are to improve the quality of our lives, our comfort level, and to become better connected with each other in an effort to reduce or prevent crime. This is a shared responsibility and we need your involvement – it’s as simple as a commitment to be aware, observant, and report. Speedway’s Neighborhood Watch program is divided into four districts, each with a District Coordinator who is a liaison between the residents and SPD. For more information on the organization of the program and a map, please see the About Us page. Information will be shared through this blog as well as through Facebook, Twitter, YouTube, email, etc. We will be working hard to provide good information and content that residents find useful. In addition to connecting online, we do hope you will also attend your District’s meetings, which we will strive to make YOUR meetings, with topics of interest and help to you. On March 11, 2014 at Speedway High School, we held a Neighborhood Watch Symposium, which encompassed all four districts. We welcomed all of you to join us to share your thoughts and ideas; as well as questions or concerns. It was an interactive meeting, where residents were given information on their District, and a change to meet your District’s coordinator, and have discussions on all of the above. Many Speedway residents attended this very important meeting, and we were pleased with the turnout, and the enthusiasm of those in attendance. We hope you will all share this page with all of your Speedway friends and neighbors to help spread the word! Together, we can create a strong Neighborhood Watch presence to prevent / reduce crime, allowing Speedway to maintain a good quality of life for people to live, work, and play.